Today I schlepped down to the Reference Library for the inaugural Literary Café. Katherine Barber, editrix of the Canadian Oxford Dictionary (q.v. 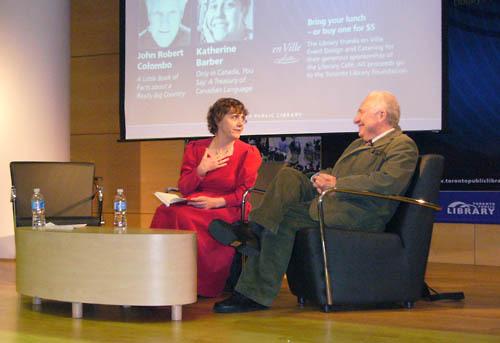 ), and prolific Canadiana documenter John Robert Colombo gave short presentations. There followed Q&A from host Tina Srebotnjak and the audience, where I was the second-youngest person in attendance. Barber was sounding as mediævalist as ever and looked very much more so in a red gown of the sort I would associate with Christmas choral performances, which may be another place she wears it. I didn’t take many notes of what the erudite and garrulous, though initially nervous, Colombo actually said; not a lot of it was about Canadian English, one of my things. [There are about 2,000 Canadianisms in the Canadian Oxford’s 170,000 words.] We sweated blood finding those 2,000 Canadianisms. It’s the work that goes into defining them as Canadian [that’s the problem]. It’s all the other words you choose to put in a Canadian dictionary that you wouldn’t in an American dictionary because we come across them more [as in hockey, curling, figure-skating terms, names for native peoples]. It’s much more than 2,000. But I’d encourage you to coin a Canadianism of your own and get your friends to use it. Though you’d need much more than your friends using it to get it in the dictionary. Canadian English is not “dying,” because Canadians are inventive. People do always ask me about eh . My mission in this is to prove to Canadians there is more to Canadian English than eh . [Use as a tag marker is not Canadian-specific, but that’s the one that gets all the attention; other uses are and don’t.] An American said to me “I know you’re Canadian because you say [ɛ] at the ends of your sentences.” He couldn’t even pronounce it right. Q. from Srebotnjak: Why criteria do you use to decide if something’s a uniquely Canadian word? A. We are constantly reading – books, magazines, newspapers, bus transfers, restaurant menus. [She pointedly did not mention anything electronic at all, much less your own little LiveJournal or whatever you write.] We highlight words that aren’t already in the dictionary. We start with the Concise Oxford, which we call the COD. (We call the Canadian Oxford the CanOD.) It had six Canadianisms, four wrongly defined. [In their database, they can “scroll down” through 75 million “words” (surely citations) and the ones with solely Canadian uses jump out, like arborite .] Then we double-check with other lexicographers that these words really aren’t used in their countries. Some words are predominantly used in Canada, like rosé sauce . A. Gotchie isn’t a Westernism, as some people think. Gotch ‘underwear’ comes from Ukrainian. Alberta and B.C. use gonch . Guy Vanderhaeghe from Saskatchewan uses gotch . W.O. Mitchell from Alberta uses gonch . So there’s a line down the middle somewhere in New Westminster. When I first moved to Ontario, I was going to a shower and I told my boyfriend at the time I was bringing a plate of dainties . “You’re bringing your frilly underwear?” [No, it means little bonbons or cookies.] Nobody from Manitoba or Saskatchewan could misunderstand that. [More on showers.] There’s a Jack and Jill shower or, as it’s called in Thunder Bay, a shag . Imagine those poor British immigrants coming over and being invited out to a shag. [Another one is bachelors .] Renting bachelors. There are some wonderful variations. Large bachelors, large bright bachelors, refurbished bachelors. Canadians just aren’t aware of the words they use that are Canadian. [And one of the issues is spelling.] If we spell colour with a u , that’ll show those damn Yankees! — Well, we’re not about to invent our own spelling. Canadian spelling is a mixture or British and American and has been all the way back to the Loyalists, who were American. [She gets angry letters about organize , the original British spelling that the British much later reverted to -ise .] We’re just maintaining former practice. Yogourt is only ours. It’s handy because that way it works both in Canadian English and Canadian French, and it’s got a u in it like colour . — A u wherever it fits. — But people put in a u even where it doesn’t belong, like colouration or honourary . Q. from woman: When was signage coined, and why is it used instead of signs ? BARBER: I’d have to look in the Canadian Oxford Dictionary. COLOMBO: I can answer that question. [Boy, could I ever see what was coming.] It was coined by a Torontonian named [in unison] Paul Arthur, son of Eric Arthur. He was the one responsible for Expo 67 and he gave it its complete sort of code of design, with the neogothic typeface [ sic – it’s Univers, a grotesk, though gothic is used for that kind of sansserif]. [Coined in 1964.] I heard this from him myself and I’ve included this in one of my quote books. BARBER: It’s a perfectly well-formed word, like luggage from lug or baggage from bag . Q. from man about spellcheckers (no matter what you select, Microsoft Word gives you American English) and apple cider . A. Cider means something different in England than in North America; in England it’s a strong alcoholic beverage, but here it just means apple juice. There is no real Canadian spellchecker out there, as anyone who’s tried to use one knows. [Well, why don’t you make one yourself? several people ask.] It’s something I’ve been wanting to do for about ten years.